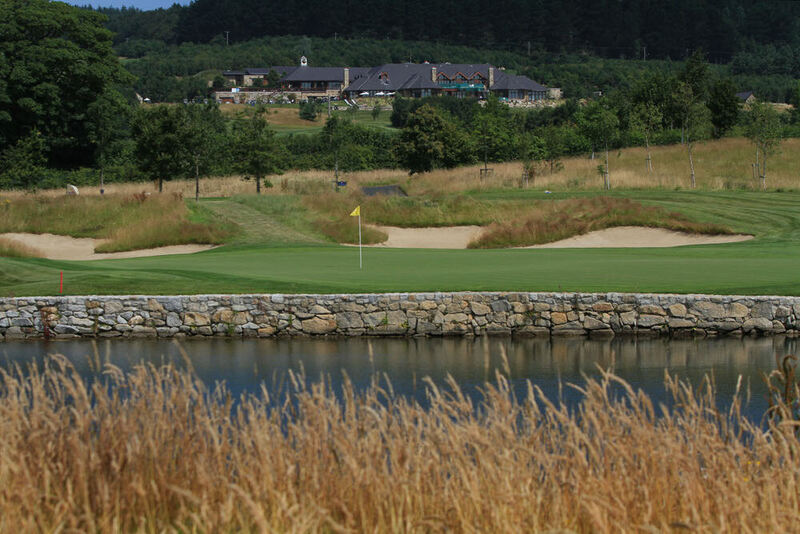 Sit in a comfortable armchair overlooking the magnificent views of the Wicklow Mountains from the high perch of Dun Laoghaire Golf Club and you could be quickly forgiven for drifting off into dreams of golfing derring-do. The vistas are so pleasing and the surroundings so painstakingly appointed that even the golfer who has failed to produce Championship winning form on whatever combination of nines were in play on the 27 hole course that particular day will soon find themselves at ease with the world. Many of modern golf’s larger complexes are commercial affairs that lack the warmth and homely atmosphere of the traditional club. But Dun Laoghaire, which gave up its modest 78-acre site on the Tivoli Road after more than 90 years and voted overwhelmingly to accept a generous offer from property developers to move to a spectacular, 320-acre home in Ballyman Glen in 2007, is not one of those. 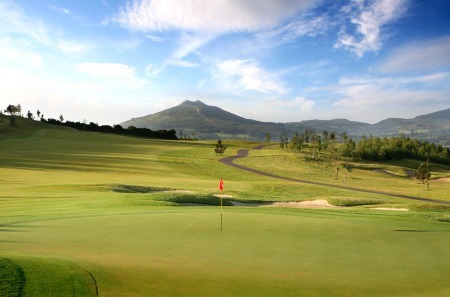 It is owned and run by its 1,500 members who enjoy 27 magnificent holes offering sweeping views dominated by the Sugarloaf and the Irish Sea. It’s a special site and it turned out to be an inspired move by the members, who also got a multi-million euro cash bonus from the developers to give up their old Harry Colt course for a state-of-the-art facility constructed to the highest possible specification by architect, Marc Westenborg of the Hawtree company. The club celebrated the tenth anniversary of its move to its new home last year and having hosted the Curtis Cup in 2016, it has embarked on the next phase of its development with no little enthusiasm and club spirit. "Ten years on, the course has really matured very well," said General Manager, Justin Lowry, who has been in situ for the past five years. Once a ferocious beast measuring 229 metres from the back tee and a forbidding 205 metres from the tees used for medal play by the men, the new hole will be open for play in mid-May, and it promises to be something special. A series of ponds will cascade down the right-hand side of the hole and run across the front, forcing golfers to carry H20 for some of the 150-metre journey to the new green. Keeping the course in tip-top shape is paramount and many noticed that while play was suspended for a few hours during the Curtis Cup and it was feared that it might be abandoned for the day, the course was playable again 20 minutes later. "All three nines are designed and maintained to the same specifications so while some 27 hole clubs have a preferred 18, we don’t,” added the man tasked with keeping the ship sailing smoothly along. “We alternate them for many reasons. Dun Laoghaire is not sand and grass, bricks and mortar but its members and the spirit of the club’s 108-year history has not been lost in the move. With more than 17,000 spectators attending the Curtis Cup, the club new has attracted many new admirers and membership continues to grow. With Kevin Kelliher, a former club junior, installed as head professional since the new course opened in 2007, the members enjoy what is arguably the most impressive facility in the country. 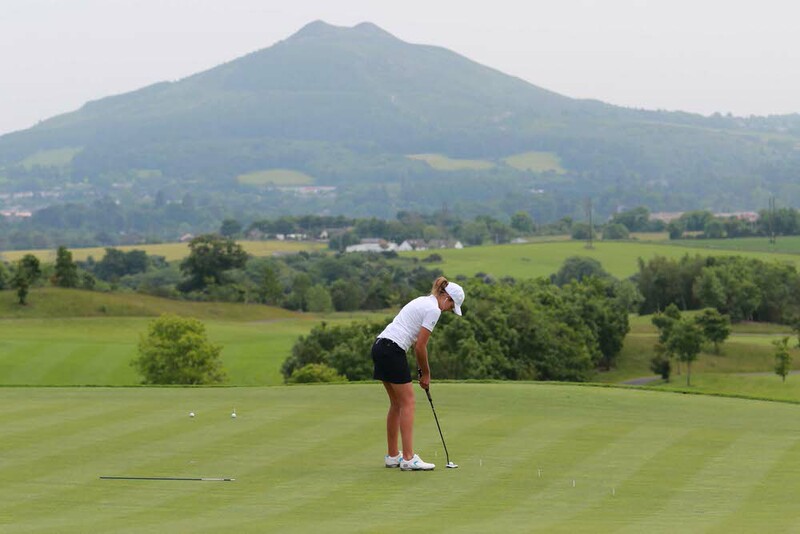 “What a fabulous place,” then Taoiseach, Enda Kenny enthused when the Curtis Cup contract between the LGU and Dun Laoghaire was signed in late 2014. “This is not a golf course at all, this is sublimely imaginative. Great Britain and Ireland went on to win that week with Ireland's Leona Maguire, Olivia Mehaffey and Maria Dunne all playing key roles. REPRODUCTION FREE 09-06-2016 - CURTIS CUP - Image from Dun Laoghaire Golf Club on the eve of this years Curtis Cup. Pictured is Ireland's Leona Maguire, ranked the World's No. 1 female amateur golfer chipping on the ninth with the DLGC Clock tower in the background ahead of the competition which begins tomorrow. Picture Nick Bradshaw The Curtis Cup Match is played every two years. The players are selected by their respective golf associations, with the USGA selecting the United States team and the Ladies Golf Union naming the GB&I players. No doubt the Kingstown residents who met at the Royal Marine Hotel for the inaugural meeting of Kingstown Golf Club in December 1909 would have been highly impressed..
Several hundred Men and Lady Associates were elected that evening and 36 acres of land were leased at Eglinton Park and Highthorn, a nine-hole course was designed; and a clubhouse was built for the princely sum of £1,265. November 1910 witnessed the extension of the course to 18 holes before Harry Colt designed a new layout after World War I that was to remain almost unchanged for another eighty-odd years. As the club grew, it became clear that it had outgrown its original home and in 2002, the members once again convened in the Royal Marine Hotel. After a long and sometimes heated debate, the offer to relocate was accepted by 79 percent of the members. While losing an old friend can be traumatic, the move has turned out to be a great success. It’s not that the 27 holes - complete with five sets of tees - give the humble rabbit as much pleasure as they do the tiger but that the club has retained the vibrancy that made it such a success in the first place. If your golf fails you, the views are worth the trip alone. 7th Middle – A spectacular hole that requires a very accurate tee shot in order to avoid a number of hazards. The lay out of the hole challenges golfers to make a carry of 150 metres from the championship tee to a narrow 2-tiered green. The green is protected by a large bunker to the left and a cascading water feature to the right.